Steve Greenstein of the Sanibel Captiva Trust Company congratulates Dr. Zack Stanton on being selected for the Trust Company’s Inaugural Prize, while conductor Jeff Fox looks on. 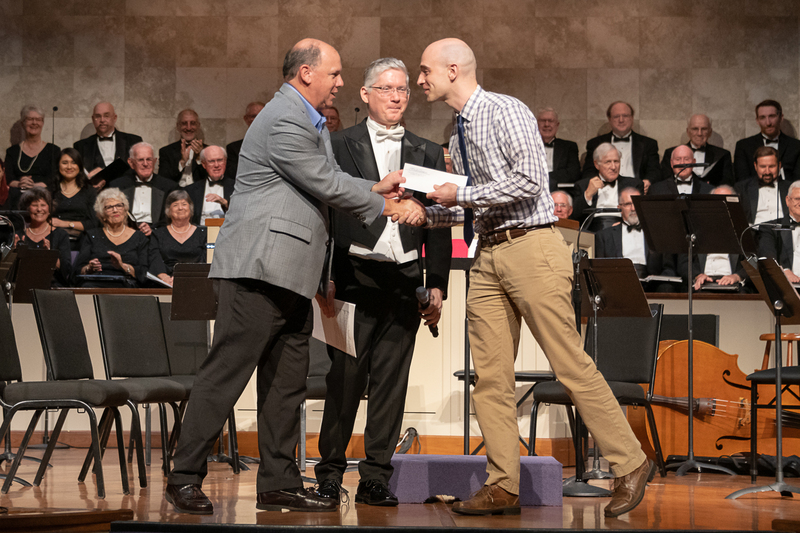 The final Fort Myers Symphonic Mastersingers concert of the season was held on Friday, April 5 at the First Presbyterian Church of Bonita Springs, where Dr. Zack Stanton was awarded the inaugural Sanibel Captiva Trust Company Prize in Choral Composition. Over 200 entries were submitted nationwide and Dr. Stanton’s work Before You Kissed Me (text by poet Sara Teasdale) was chosen as the winner by Artistic Director, Jeff Faux.